In Gibson's Neuromancer, when Case & Molly meet the two surviving founders of Zion, there is talk of hearing a "mighty dub" in the Babel of tongues signaling the "final days". 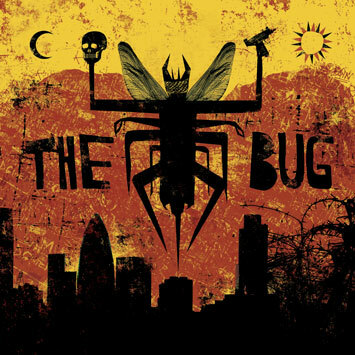 If indeed we're living in these 'end times', as many predict, then there can be no more of an appropriate soundtrack for the coming apocalypse than The Bug's "London Zoo". "London Zoo" was born of three key moments. An introduction to the thriving Dub-Step scene (of which The Bug is very much a pioneer before it carried a name) and it's key producers (via Kode 9) where Kevin realized there was others on the same sonic trajectory as himself, an introduction to Warrior Queen via his work with Wayne Lonesome on the Razor X Productions project, and a Mary Anne Hobb's Breezeblock session which introduced him to Flowdan (Roll Deep), and Ricky Ranking. All three of which figure heavily in the end result and live presentation. Although the obvious entry point to the album will be the Dub-Step tag, particularly after the success of the three lead up singles ('Jah War', 'Skeng', and 'Poison Dart' in that scene) it's a record that clearly reaches past and brings together/celebrates reference points from dancehall, grime, hip-hop, and noise onslaughts. A record that could have only come out of London sound-system culture but whose appeal spans past any singular city or scene. From the opening strains of "Angry" (featuring reggae legend Tippa Irie) it's clear that the world has been served notice from the heart of the UK capital. A position further strengthened as Ricky Ranking (best known for his work with Roots Manuva), Flowdan, Warrior Queen, Spaceape, Roger Robinson, Killa P, and Aya step up to lay waste to the boombastic rhythms put before them, eventually culminating in "Judgement" where Ricky Ranking leaves us with a prophecy ... "so much people are losing their minds, because we're living in a serious time. I guess it come in like a judgement sign, the people have killing on their mind".... living in end times indeed. Best start building the Marcus Garvey tug now.